Commissioned by the Concertgebouw Brugge and the London Wigmore Hall, this work was written in 2014. 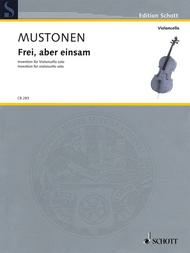 It is dedicated by Olli Mustonen to the outstanding British cellist Steven Isserlis who also performed the world premiere. With its frequent, surprising changes of tempo, yet steady note values, the music of this short invention hints at the title of the work.